Big bucks lobbying against marijuana referenda… while a reader starts a doobie donnybrook! Two steps forward, one step back for gold — which isn’t a bad place to be, really. Gold popped a bit on Friday as a wave of volatility hit nearly every asset class — about which more shortly. This morning, it’s pulled back to $1,274. No doubt gold’s drop from $1,330 to $1,250 earlier this month was painful for gold owners who follow the charts. But was also a gift — and not just in the sense that it was possible to buy more ounces at a discount. “Interest rates are not likely to go much higher,” Zach said. Once the Fed pulls the trigger in December? “Rates will still be exceptionally low,” Zach went on. “And the Fed won’t be able to keep raising rates, because the global economy is still very fragile. “When gold traders realize that the Fed has its hands tied, they’ll have to rethink the logic of a higher dollar (and lower gold prices),” Zach concluded. Again, he said this to his premium subscribers two weeks ago. From this analysis, he made three recommendations from which readers could collect income. Instead of “cash for gold” as you see at pawn shops, Zach showed his readers how to generate cash from gold — even readers who don’t own any metal. One payment was for $210… a second for $420… and the third for $280. And this wasn’t a one-shot deal. All this year, Zach has made similar “cash from gold” recommendations — while gold was going up, while it was meandering in late summer and early autumn and after it tumbled this month. It’s easy. Even people who have no financial background at all can pull it off in as little as a minute and 42 seconds. See for yourself when you click here. The major U.S. stock indexes are stabilizing after a bout of danger — Carlos Danger, heh. After we went to virtual press on Friday, the Dow tumbled 150 points in an hour when news broke that the FBI was reopening its investigation into Hillary Clinton’s private email server, and all those baked-in assumptions that Clinton was the presumptive 45th president were suddenly called into question. The Big Board recovered, but it still ended the day rather lower than it began. This morning as we write, it’s nearly unchanged at 18,164. It’s the day of the merger — to the benefit of many of our readers. In telecom, CenturyLink is buying Level 3 Communications for $25 billion. But the bigger story is that General Electric will combine its oil and gas operations with Baker Hughes — one of the Big Three oil services companies. For now the firm is being called “the new Baker Hughes.” It will be 62.5% owned by GE shareholders and 37.5% by BHI shareholders. For the aforementioned Zach Scheidt, the deal affirms one reason he likes GE in his flagship newsletter Lifetime Income Report: GE is returning to its roots of industrial technology, dumping the finance-oriented businesses that landed the firm on Uncle Sam’s bailout list in 2008 alongside the banks. GE stock popped nicely on Friday when rumors of the tie-up first surfaced, and it’s holding onto those gains today. The biggest semiconductor buyout in history is a disappointment for our Ray Blanco — “disappointment” meaning a 20% gain in less than three months. Late last week, Qualcomm confirmed rumors it was buying NXP Semiconductors for $39 billion. Although NXPI had grown into a behemoth, Ray says it never stopped innovating. “It is a participator in and enabler of some of the biggest emerging tech trends — secure identification, electronic payment systems, self-driving automobiles.” That’s why he recommended it back in August. 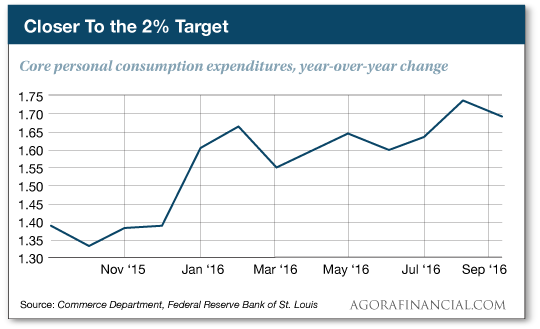 The mighty American consumer has returned to his spendthrift ways, judging by the Commerce Department’s “income and spend” numbers. Personal incomes grew 0.3% in September — less than expected. Meanwhile, consumer spending grew 0.5%. That reverses the trend of the last two months in which incomes were growing faster than spending. “When they start weighing cash, it’s a sign of runaway inflation,” says Jesús Casique of the firm Capital Market Finance. And that’s what’s happening in Venezuela. If voters pass those marijuana referenda we were talking about last week… it won’t be without a fight by Big Pharma. According to The Nation, Purdue Pharma and Abbott Labs are among the biggest contributors to an outfit called the Community Anti-Drug Coalition of America — one of several groups buying commercial time in states where marijuana measures are on the ballot. Not coincidentally, Purdue makes the opioid painkiller OxyContin and Abbott makes the opioid painkiller Vicodin. Indeed, Big Pharma is funding several groups that on the surface look like grass-roots groups of concerned parents. The biggest funder of Arizonans for Responsible Drug Policy is Insys Therapeutics. It makes a painkilling spray that contains fentanyl — the substance linked to several overdose deaths, including that of Prince. That said, the polling data still look favorable for passage of legal-marijuana measures in several states, including California. That would be especially good news for the “penny pot stocks” working on painkillers derived from cannabis that don’t have the addictive downsides of opioids. Competition is a good thing — and very profitable if these referenda break the way we expect. “Studies have shown regular alcohol usage leads to liver disease, irregular brain activities and low energy/recall. We’re not going to eliminate alcohol, so don’t limit marijuana use either. “I can only speak about the laws in Oregon,” writes a third, “because that is where I live. Here, ALL marijuana must be tested for any traces of pesticide, herbicide or chemical fertilizer at a certified lab before it can be sold at any dispensary. It is zero tolerance. “Compare that with grapes grown for wine — no testing whatsoever. And grapes grown for wine, with the rare exception of organically grown grapes, are known to be some of the heaviest herbicide-sprayed crops grown. Who wants to drink wine contaminated with Roundup? Not me! Where is that discussion? “Promoting cannabis companies as if marijuana is a nonaddictive alternative to booze, heroin and prescription painkillers does not earn you a high five from me,” writes a dissenter. “I notice that you did not mention tobacco as part of your addictive list. “I lived in Iran from 1975–79. At that time, 80% of Iranian men smoked opium (my guess is that this is still about the same today) with only 0.2% of them ever becoming addicted. Why did so few become addicted? Because they recognized that addiction comes from doing something in a repeat pattern. They avoided any form of repetitive pattern. “With opium readily available, Iranians for the most part left marijuana alone. Foreigners, on the other hand, generally preferred marijuana. Sometimes plants could even be found growing along the side of some streets in Tehran. Many foreigners had a repetitive pattern of using marijuana, and thus, addiction was more frequent. The 5: Maybe, but it feels as if you’re putting the cart before the horse. P.S. Controversies aside, there’s no denying it: Marijuana legalization is sweeping the country. Starting a week from tomorrow, dozens of tiny marijuana firms could skyrocket by 100%, 300%, 500% or higher. This is your chance to turn a single $50 bill… into an absolute fortune.